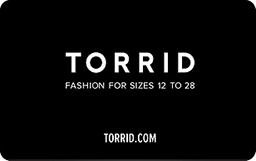 Torrid is a women’s clothing store for on-trend skirts, dresses, shorts, pants, swimwear, novelty tee shirts, fashion tops, Capri pants, intimate wear, hosiery, shoes, accessories and beauty products. Use Torrid eGift Cards at torrid stores throughout the USA. Sell Torrid gift cards on Cardpool.